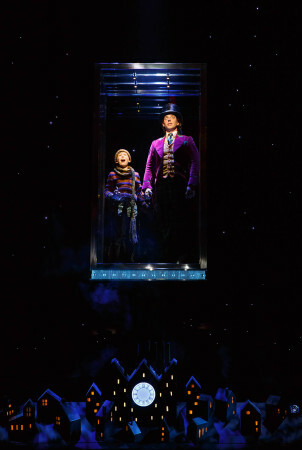 Broadway producers have taken blue chip title Charlie and the Chocolate Factory, which had mixed reviews in London, and diminished it to the point where it almost seems to be some sort of elaborate practical joke. Not that customers who are paying $300 for preview tickets are laughing. Housed at London’s prestigious Theatre Royal Drury lane, the 2013 musical Charlie and the Chocolate Factory actually enjoyed a healthy run of three years and seven months. Before it opened, hopes looked high for the family favourite, with Hairspray composers Marc Shaiman and Scott Wittman on hand to write the songs, and Sam Mendes to direct. Looking back now, Mark Thompson’s designs for London were a highly creative, sumptuous visual feast. Thompson remains on board as scenic (and costume) designer, but appears to have had the set construction budget drastically slashed. Looking at it cynically, there is a possibility that it was more important to be able to easily take the production on tour. Act two is where the mind boggling scenic budget cuts really have an impact. The act takes place within three plain blue walls. A small set is wheeled on to represent what should be the show’s most extravagant set – Wonka’s candy garden and chocolate river. The set is only big enough for one person to squeeze onto at a time. Going on, the gum machine is tiny, the squirrels just have a single simple conveyor belt for their nuts and the television room also has one small central set piece. At one point, Wonka leads the families through a dangerous maze, represented by a couple of lights on the floor. Wonka himself may deny that the journey through maze is mime, but mime is what it is, and junior high school mime at best. The production here includes a very safe and sedate ride on the Great Glass Elevator. In London, the elevator went off the stage and up into the auditorium, leaving a magical final impression. These reductions in scale of production may have been more palatable if the musical itself was more appealing. Act one is now streamlined to one hour, and still ends with the ticket holders entering the factory. Towards the end of the act, Mrs Bucket sings “If Your Father Were Here,” which should be sweet but is really rather dreary. The songs introducing the other children in act one are quite fun, but there is not a memorable new song in the show. Speaking of those four other “children,” they are being played here by young adults. Charlie is still played by a boy (at this performance, the plucky and rather adorable Jake Ryan Flynn) but the other four children are played by adults. Given the success of current Broadway hit School of Rock, and the fact that young audiences like to see fellow children on stage, this ultimately seems an odd casting choice. Broadway director Jack O’Brien, working with book writer David Greig, has set the production in the present, which works perfectly well. Joshua Bergasse has provided some snappy choreography, particularly for the diminutive Oompa Loompas. 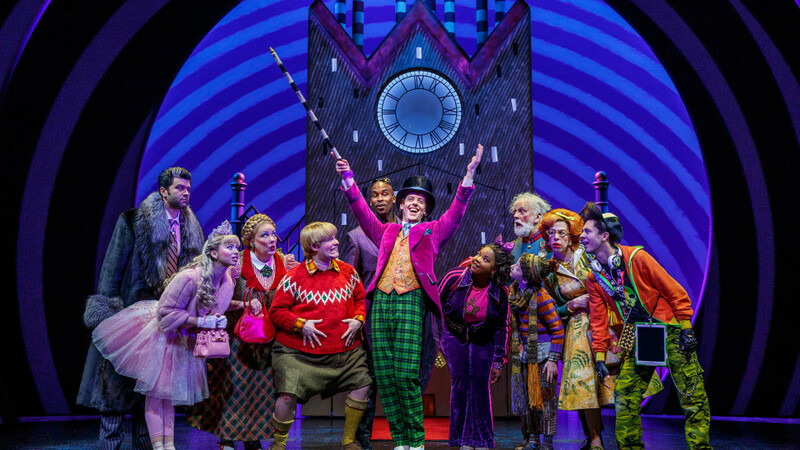 Popular Broadway star Christian Borle brings plenty of amusing quirks to Willy Wonka, but overall pushes too hard where the role should be far more sinister and wickedly charming. 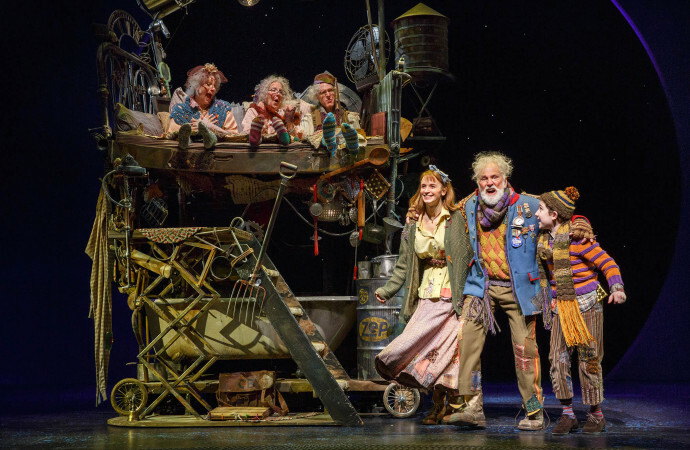 Legendary veteran actor John Rubinstein shines as kindly Grandpa Joe. Adult music theatre fans will enjoy choice comic character actress Jackie Hoffman as Mrs Teavee, who plays the role as a conservative 1950s housewife, albeit one with orange hair and a drinking problem. 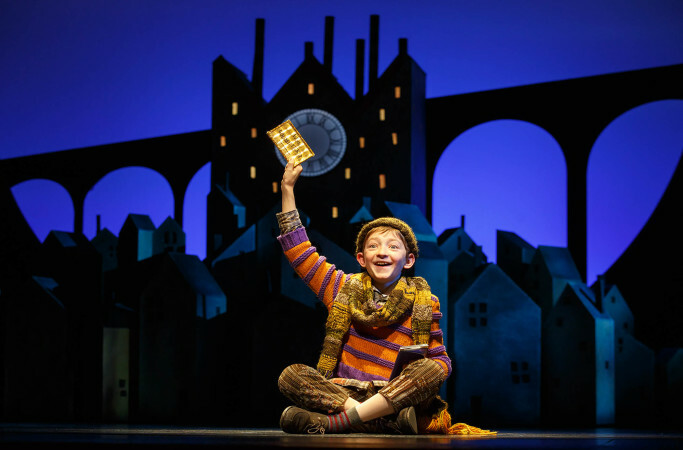 Charlie and the Chocolate Factory may have some curiosity value for Broadway completists, but at this stage the only recommendation that can made is to avoid it, especially at the excessive prices being charged (up to $US299 plus booking fees). 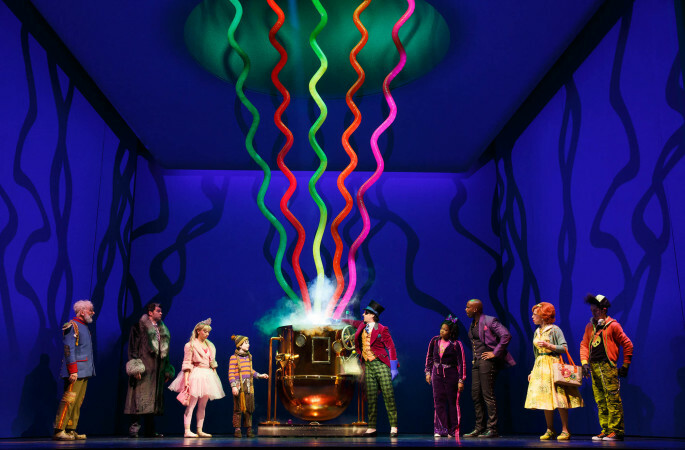 Charlie and the Chocolate Factory was reviewed 8pm Saturday 8 April 2017 at Lunt-Fontanne Theatre, New York. Official opening night is 23 April 2017. Great Broadway reviews Simon. What is the best way to purchase Broadway tickets from Melbourne? Thanks very much Rob. All Broadway may be booked online from either Telecharge or Ticketmaster. I find the booking fees to be prohibitively high, so I usually only book a couple of shows (the most popular) and then book the rest when I arrive. There are no fees when buying a ticket at the box office of a theatre. Plus there is TKTS once you are in Broadway. Hope you get a chance to visit Broadway soon. Thanks again, Simon, for your advice on tickets. The online booking fees are amazingly high.